Although flight attendants, formerly known as stewardesses and stewards, make passengers comfortable on airplanes, that is not their primary responsibility. Passengers' safety and the flight deck's security are their chief concerns. They assist passengers in emergencies, keeping them calm and safe. They also serve beverages, snacks, and sometimes meals. This career involves both security and hospitality and offers an opportunity for individuals who want to provide safety and service to people while seeing the world. A flight attendant's salary varies based on the individual's level of experience. Additionally, the airline, geographic location, and the ability to speak other languages may also affect pay levels. While a high school diploma is a minimum requirement for anyone who wants to become a flight attendant, many employers prefer to hire job candidates who have a college degree. As a new flight attendant, once you have completed formal training, an employer will place you on reserve status. This means you will only work when called upon to fill in for absent or vacationing employees or on extra flights. Expect to remain on reserve status for at least one year or longer. Depending on staffing, it could take up to seven years. Eventually, you will be permitted to bid on monthly assignments. Security verification: Candidates must successfully complete a 10-year background and credit check, FBI fingerprint check, as well as pre-employment and random drug and alcohol testing. Age: Although the Federal Aviation Administration (FAA) mandates that flight attendants be at least 18 years old, some employers have higher minimum age requirements. Many airlines prefer to hire job candidates who have experience working with the public. Physical requirements: Employers will require you to meet a certain height requirement in order to reach overhead storage bins, of between 5’0 and 5’11 (without shoes). Your vision must be correctable 20/40 or better. You must also maintain good physical fitness, and practice good grooming, hygiene, and etiquette. Training: All newly hired flight attendants receive three to six weeks of formal on-the-job training from their employers. After completing an employer's initial training program, individuals need to get certification from the FAA. Flying on other types of aircraft requires additional training and certification. Your formal training will prepare you to perform your job duties, but specific soft skills—personal characteristics that you were born with or acquired through life experiences—are also needed. 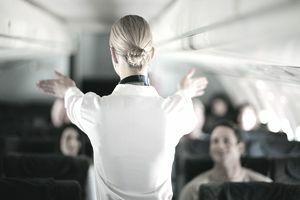 Service orientation: Flight attendants must be attentive to passengers' needs. Interpersonal skills: You must possess excellent communication skills and have a professional and conservative appearance. In addition, your ability to empathize with, and persuade and coordinate your actions with others, will allow you to interact well with customers, fellow flight attendants, pilots, and other airline staff. You will have more job prospects if you possess at least two years of customer service experience. Active listening: Your ability to understand and respond to your customers will allow you to perform your job well. Verbal communication: Since safety is your primary concern, you must be able to clearly convey instructions to your passengers and crew. Critical thinking: The ability to use logic to solve problems and make decisions, especially in stressful situations, is essential. Ability to relocate: Flight attendants must have a willingness and ability to relocate according to operational needs. According to the U.S. Bureau of Labor Statistics, the growth outlook for flight attendants over the next decade relative to other occupations and industries is higher than the average for all occupations, driven by new, larger aircraft that can carry more passengers and require more flight attendants. Employment in this occupation is expected to grow by about 10% over the next 10 years, which is faster than the average growth projected for all occupations between 2016 and 2026. Growth for other air transportation workers is projected to be 7% over the next 10 years. These growth rates compare to the projected 7% growth for all occupations. Competition is strong because of the number of candidates available as compared to the number of job opportunities. A college degree can increase your prospects, and jobs will continue to be available due to the need to replace flight attendants leaving the occupation. Since many flight attendants remain in their jobs for longer than they did in the past, competition for those new to the field is fierce. Your advancement from reserve status to having the ability to choose assignments will be slow. While airlines employ the majority of flight attendants, some work for corporations or companies that charter flights. Flight attendants spend most of their time working in the cabin of an aircraft, and they must interact with difficult customers, handle air turbulence, follow and enforce a variety of safety measures, and serve food and beverages. When you first start out, and possibly for some time, you won't be able to choose the most desirable routes. With all of the travel perks, you'll have the trade-off of having to work irregular hours and during weekends, evenings, overnights and holidays. As representatives of the airline, flight attendants must present themselves in a well-groomed and professional manner. Tattoos and body piercings may not be visible while in company issued uniform and may not be temporarily covered with bandages or make-up; tattoos on any areas of the hand, fingers, wrists, neck, and head are not allowed. Work schedules often vary, and flight attendants must work nights, weekends and holidays as many flights take place during these times. New flight attendants may need to be on call and ready to work on short notice. Look at job-search resources like Indeed.com, Monster.com, and Glassdoor.com for available flight attendant positions. You can also visit the websites of airlines directly to apply to open job positions. Play up any useful experience that can help set you apart, such as fluency in additional languages. Gain experience and valuable contacts by interning with an airline. Start by visiting the company's website to see if they offer internships. You may spend all of your time on the ground since you will likely be working in an administrative department of the airline. However, companies such as Southwest Airlines offer perks such as free flights within the U.S. for individuals who join their intern program, and you may be able to make contacts that can help you land a flight attendant job.